And the dollar it founders, and the wild ocean heaves, and the distance between us it widens with no mercy, no sign of reprieve. New Zealand artists Cy Winstanley (guitar, vocals) and Vanessa McGowan (bass, vocals) took a long, winding path to become the Americana roots duo Tattletale Saints, and that shows in the music on their debut full-length album, How Red Is The Blood. Both met in a jazz big band–Vanessa actually has a Masters of Jazz Bass from University of Nevada, Las Vegas–but were drawn together over a shared love of American roots music. 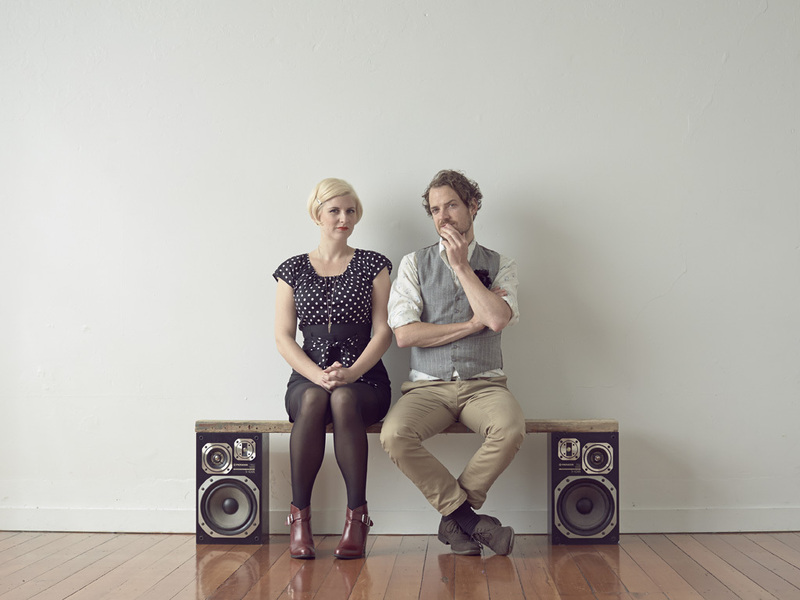 Both come from New Zealand, but have traveled all over and actually formed their first Americana band in London. Now they’ve returned to New Zealand to form the critically acclaimed roots duo Tattletale Saints. With the help of a successful crowd funding campaign, Tattletale Saints were able to travel to Nashville to record their new album at Butcher Shoppe Recording Studios (part-owned by John Prine and the birthplace of many of Johnny Cash’s hit records). Tim O’Brien jumped on board to produce the album, bringing his experience as a Grammy-award winning Americana tastemaker and joining in on fiddle and mandolin as well. The result is an album that joins the beautiful simplicity of American roots music with hard-biting songs that echo a generation’s distress. On their new album, the effortless, effusive nature of Tattletale Saints’ songs cleverly disguise the subversiveness of the lyrics. “Doctor, Doctor” sounds for all the world like a breezy jazz song, and Cy’s vocals could fit well in any jazz club today. But the lyrics speak to the harm that prescription drugs have wreaked on an aging generation held in the grip of huge pharmaceutical corporations. “Kathleen” is perhaps the catchiest song on the album and sounds like a lovely heartfelt folk song written for young love, but the song flips into deep darkness on the last verse, warped by the danger of unexamined love. The song “Fell Upon the Fields” is anchored by a cheerful fiddle melody (played by Tim O’Brien) and is written almost like an old cowboy ballad. But the lyrics are born from the dreariness of a London winter (a city that Cy called home for 7 years, some of which as a busker on the underground) and the hopelessness of a disaffected generation. As the singer reflects through the London fog to his fantasies of life out on the Western plains, you realize that the song itself is the fantasy; a sunny ranch hand melody desperately needed to brighten a young man’s dark day. Tattletale Saints love contrasting opposites, and many of their songs play with elements of light and dark, both in the melodies and in the songwriting. There may be a temptation to label Tattletale Saints as just another young folk band singing the same old songs, another cog in the Americana wheel, but this would be a grave mistake. Tattletale Saints makes music that lures you in with its familiarity, but stabs deep as a knife. It’s the perfect example of the folk music of a new generation: bitter and furious at the state of the world, but unable to let go of its love for the roots of American music and the hopefulness of true folk songs.